If Aperols is not your thing, why, substitute some white rum instead. Here’s the orginal post! Having brunch? Want something far, far beyond a mimosa? Read on. In the West Village on 11th Street, just past Hudson, there is The Spotted Pig, the extraordinary restaurant from April Bloomfield. If you can dine there, it is a must. If you cannot, then pick up a copy of A Girl and Her Pig [you can’t miss it, picture of April standing proudly with a pig draped over her shoulders, has to be the only thing like it in the bookstore]. A Girl is filled with lovely, no, exceptional recipes. The Pig is a favorite restaurant for Suzen and me in a city rich in good establishments. Actually, The Pig became a favorite for me before I ate a bite. Suzen had ordered cocktails. “You will like this surprise,” she assured me. I waited for the waiter. I took a sip and Suzen saw it in my eyes. “May I?” she extended her hand. I let her sip and saw, I suppose, in her eyes what was in mine. “Has to be,” she agreed. Hence the picture, for back home I took down my Aperol and St-Germain, and I split my grapefruit. It was all about the proportions. I kept trying to duplicate The Harlow. I got close, then distant, then closer. But I never got it right. So yesterday, I went to The Spotted Pig, sat down at the bar, and asked for a deep favor. She smiled, mentioned with pride the drink is her concoction, and let me watch, guiding me through every step. “There’s no grapefruit?” I asked. It looked like lemon juice she was pouring. Here is the recipe, straight from The Pig, The Spotted Pig. 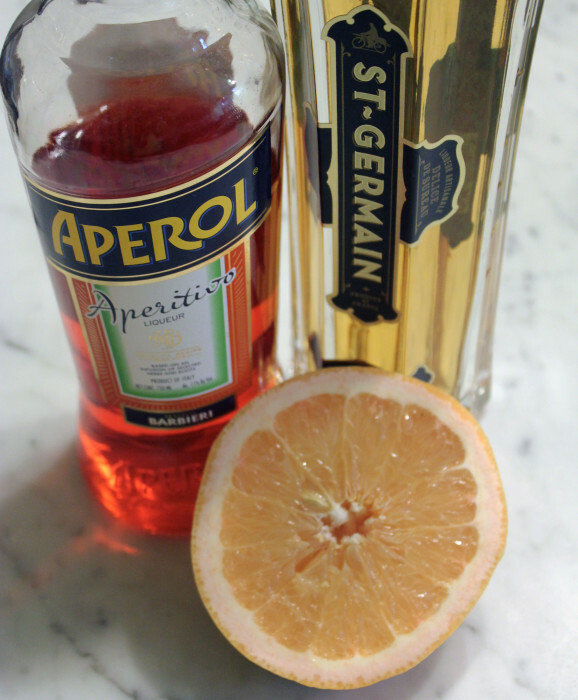 You’ve seen Aperol drinks aplenty recently and many cocktails using that grand St-Germain. But The Harlow is the one drink that combines them both, and does so powerfully. I cannot describe how refreshing The Harlow is. I can only encourage you to make it yourself and relish every sip. No grapefruit. Fresh, really fresh, lemon juice. Select a tall cocktail glass and chill it briefly. Fill the glass with cracked ice. Pour in the Aperol and St-Germain. Add the lemon juice and stir with a long, slender cocktail spoon. Add the Cava, slipping down the side of the glass so it does not bubble outrageously. Top off the glass with club soda, to be true to the original recipe. Or, top it off with more Cava, if you desire little less subtlety.